SOUND CLIPS: SCROLL DOWN TO PAGE BOTTOM! WORKS ON ANY TUBE AMP ! Extreme down scaling, like from 180W to 5W or from 30W to 1W. This mod does NOT work like an attenuator, no signal gets attenuated. The output power is reduced via circuit. A rotary switch is installed. The lower you go on the wattage the cooler the tubes run because they dissipate less power. Tube life is PROLONGED . 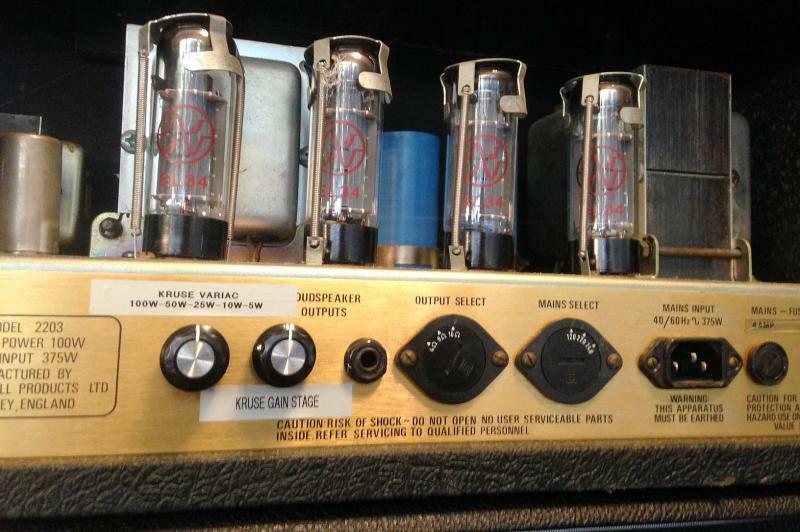 The power tubes become clip and become more saturated, thicker and richer sounding at much lower volume, allowing for old school Vintage overdrive. 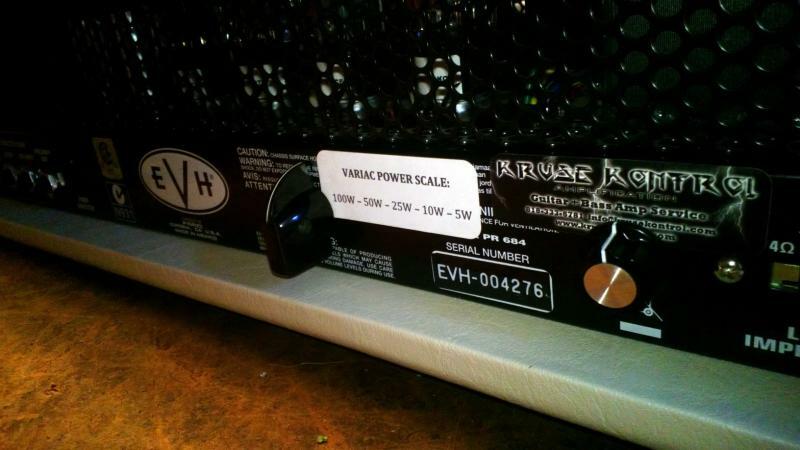 You can bring powerful amps to small venues. Just scale it down to the required output level. Your spouse won't shut you down or divorce you ! Your neighbors won't call the cops ! 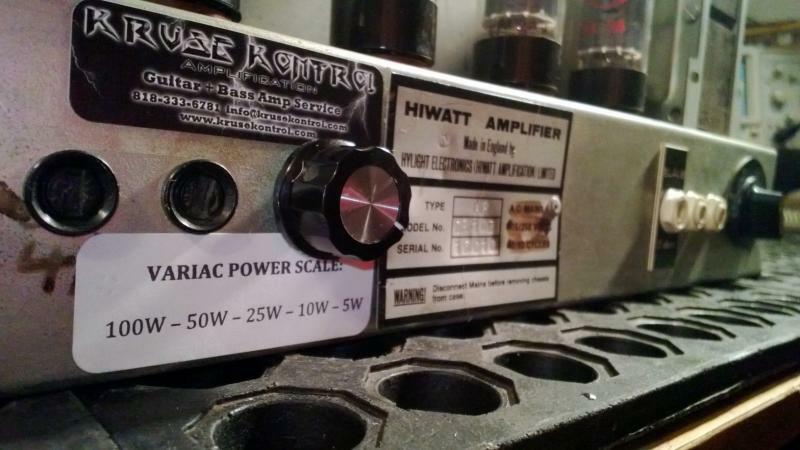 Scale down gradually from 120W - 50W - 25W - 10W - 5W, ﻿crank the volume knob and get nice power tube saturation at low volumes. 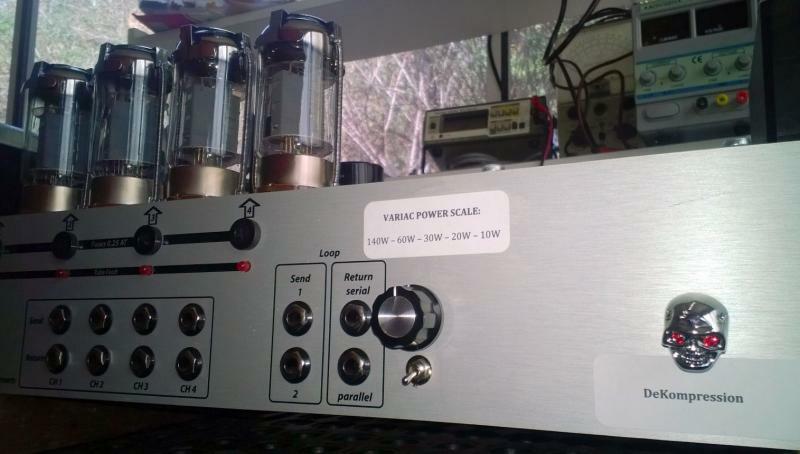 Scale down gradually from 100W - 50W - 25W - 10W - 5W, ﻿crank the volume knob and get nice power tube saturation at low volumes. With this amp model the tone gets better at the lower output settings ! CAN BE INSTALLED ON ANY TUBE AMP MODEL ! 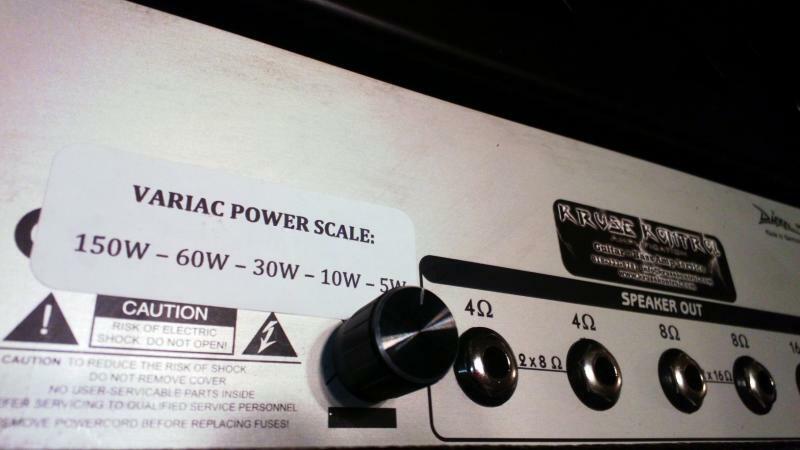 Scale down gradually from 100W - 50W - 25W - 10W - 5W, ﻿crank the volume and get nice power tube saturation. 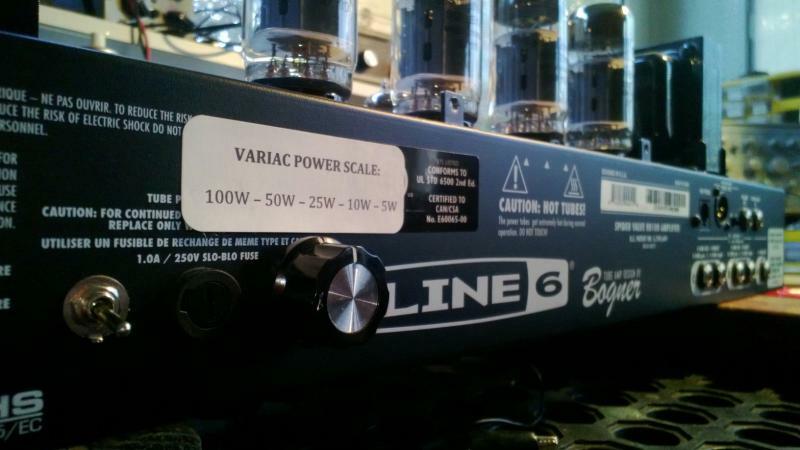 Scale down gradually from 140W - 60W - 30W - 20W - 10W, ﻿crank the volume and get nice power tube saturation. You can dial in as follows: 150W - 60W - 30W - 10W - 5W . At the lower settings, ch1 gets super Vintage sounding, like a cranked Vintage Plexi or Hiwatt. Ch2/3/4 get super saturated at low volume levels, a joy to play and covers any music genre. You can dial in as follows: 60W - 30W - 10W - 5W - 3W . Select from 100W - 50W - 25W - 10W - 5W . You can dial in as follows: 100W - 50W - 25W - 10W - 6W . 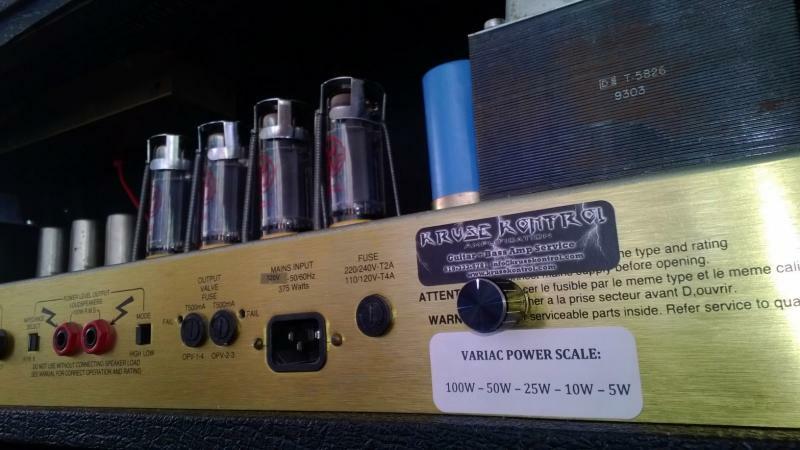 This Marshall Plexi's VARIAC POWER SCALE mod goes from 100W - 50W - 25W - 10W - 6W . At the lower settings this amp overdrives very nicely without the need of a Master Volume ! Below is the Variac Mod installed on a 100W Plexi. The pot on the left lets the user gradually decrease output power at power tube level. In this case from 100W to 10W (fully cranked). It created a saturated brown sound. 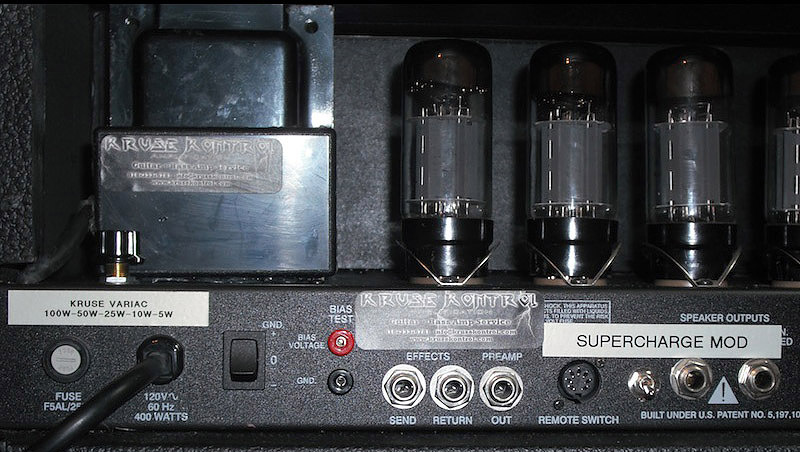 This amp has a DSP preamp with 12 amp models and the most important effects. 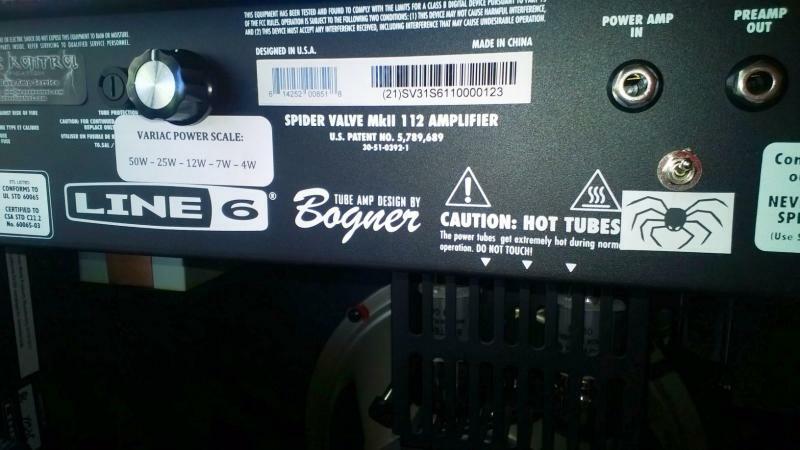 The power amp is a Bogner design and run by 4x 5881's. No thinning of sound, the complete opposite to power breaks ! 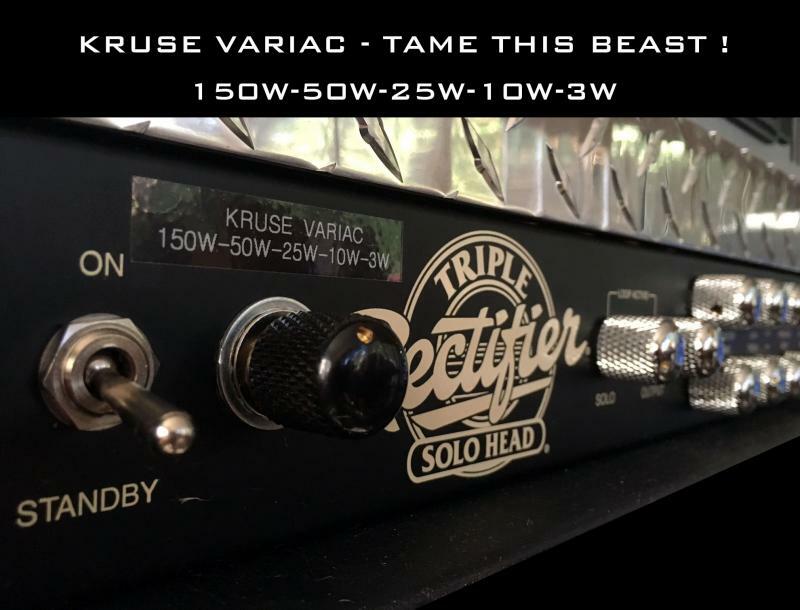 The Kruse Variac in my EVH-III 100W is way cool. It does not alter the tone in any way when you scale the power down. You actually get a different feel depending on how you want to play. 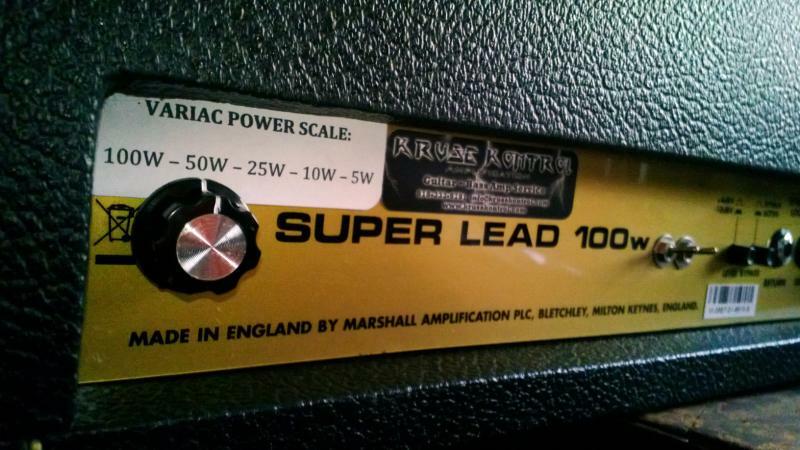 It just adds to the versatility of this now amazing amp. Many thanks to Jens for tweaking out my 80's JCM 800 and adding his killer VARIAC. Sounds amazing at 100w and still loud and rocking at 5w. EVH III 100W B-2 Stealth Modded: ﻿The Kruse Variac is just plain cool and gets cranked tones at bedroom-volume levels. Perfect for someone like me who plays a lot at home. 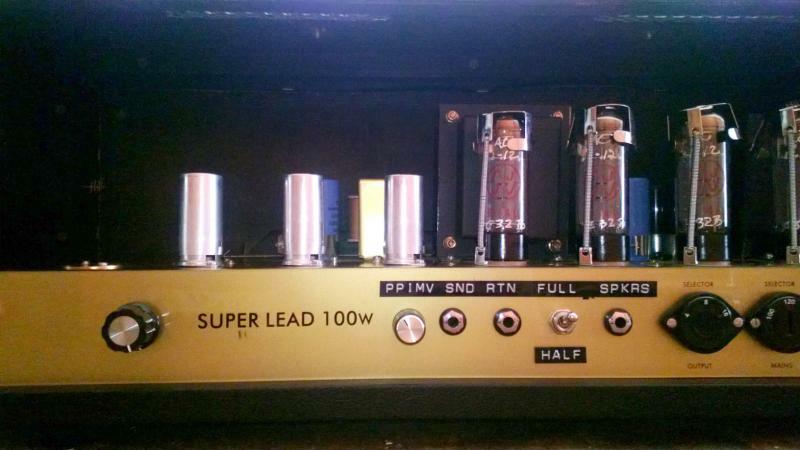 Marshall Plexi 100W re-issue: It had a high gain mod installed with dual master volume plus gain/boost mods, but ﻿I wanted to drive the power tubes at a lower volume. I just got it home and could not stop playing for 5 hours!!! 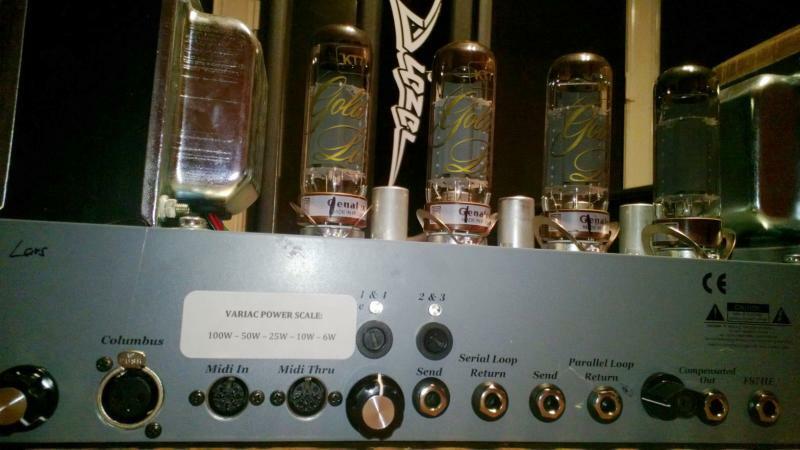 This amp sounded great before, but now with this VARIAC MOD it sounds stellar ! 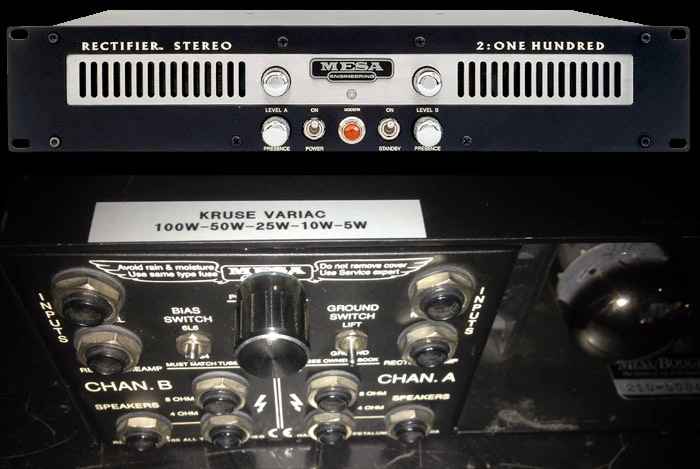 I have a Mesa Recto 2:100 power amp (200 watts Stereo) it is difficult getting lush tones at low volumes. 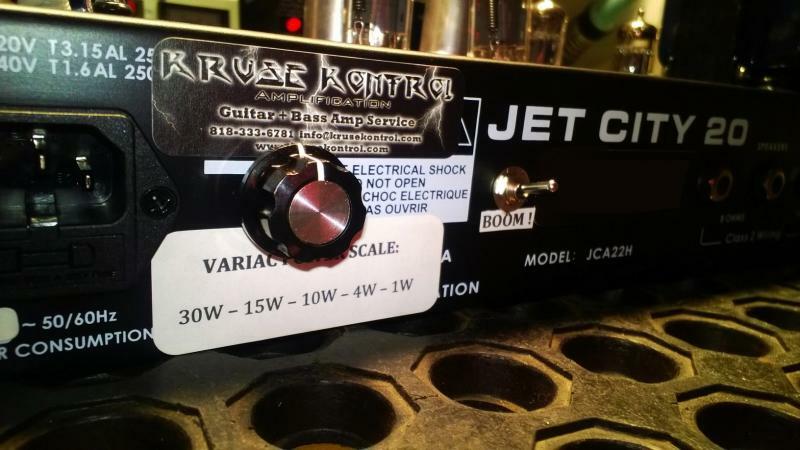 I mentioned this problem to my friend Eric (Eric’s Guitars) and he highly recommended Jens Kruse owner of Kruse Kontrol. Once I met Jens I knew I was in good hands, very friendly, honest and extremely knowledgeable (He is the real deal!) He recommended his Variac modification and took his time explaining to me so I would understand just how it works. I few days later he let me know it was ready, and I took it home. GOOD LORD! Were the first words out of my mouth, this thing is on a whole nother level now, unbelievable Gain, bite, grit and attack at lower wattage settings, and without eliminating tubes like Mesa does. It is now 5, 10, 25, 50, 100 Stereo! I couldn’t be more pleased! When he pull the amp's cover off to show the Variac Module, I was floored! His work is so clean, it looked factory. He is the real deal, and I can’t wait to bring him my other amp. When I first got my Peavey 6505+, I needed to play it quietly in my apartment, so I asked Jens @ Kruse Kontrol Amps to install his Variac Mod.